Lilac Bowl (just east of the Clock Tower). Event entry is $5 cash or $6 credit/debit per person at the event. Ages five and under are free. Seating opens at 7:00 pm, followed by event entertainment and trivia. Movies show at dusk. 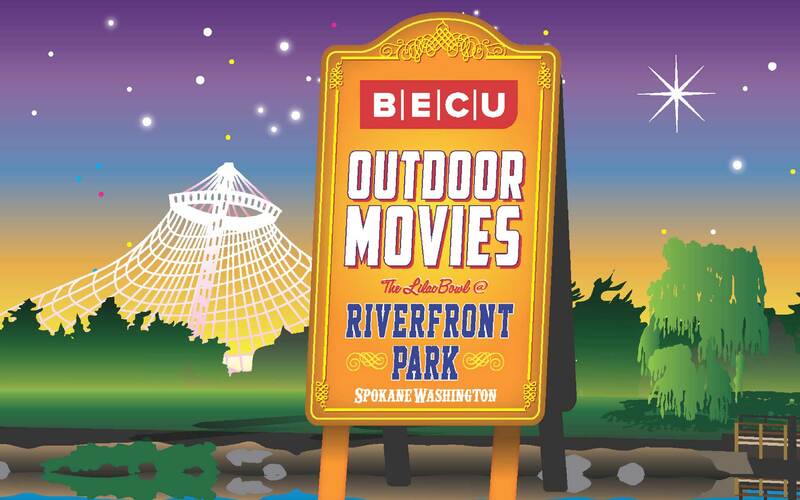 BECU Outdoor Movies are back for the summer in Riverfront! Enjoy classics, summer favorites, and recent blockbusters under the stars in Riverfront’s Lilac Bowl (just east of the Clock Tower). Bring a picnic blanket or sit on the cool grass. Pack your own snack or grab something tasty from one of the food vendors on hand. Entry is $5 cash or $6 card at the event. Ages five and under are free. Seating is at 7:00 p.m. with live pre-movie entertainment provided. Movie starts at dusk.